The term "lederhosen" is one of many examples for Austrian or German words that made it into English - in this case, since a lederhosen is a bit of a national icon for Austria, this is particularly important and much cooler than kindergarten, stein or zwieback. The lederhosen are a pair of trousers made of leather. However, if you use the term in English, you would typically refer to the lederhosen of the traditional Austrian costumes or Tracht. Here they are made of suede, come with buttons made of deer horn, embroidery in traditional patterns, leather braces and accessories like a certain type of dagger, a cummerbund-like belt or snuff tins. Lederhosen are a common piece of clothing in Austria, Bavaria and other parts of the eastern Alps. 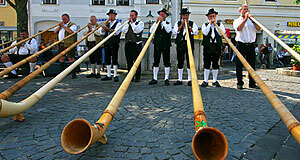 The most important area for the production of high-end lederhosen is the Salzkammergut. Lederhosen come in two variations: A short one that ends above the knees and a longer one, the "Kniebundhose" that ends underneath the knee. The former one was traditionally used for hunting and working, the slightly longer Kniebundhose was a more formal one for holidays. Another feature that allows a classification is the "Arschnaht" or "arse seam". North of the Alps, the Arschnaht attaches a pad of the size of a plate to the main part of the lederhosen. This style covers the most important "Tracht regions" Tyrol, Bavaria, Salzburg and the Salzkammergut. South of the Alps, in Styria and Carinthia, the Arschnaht simply runs in a vertical direction and includes no actual pad. Historically, lederhosen were worn by farmers and peasants. Leather is very durable, easy to clean and was cheap. There were various styles usually specific to certain regions. During the age of Romanticism, aristocrats developed an interest in folk culture. In the later 19th century, vacations on the countryside during the summer became popular, and the styles in which the locals of Alpine areas dressed were incorporated into formal fashion. On contrast to the Dirndl dress, which became fashionable in the late 19th century only, the Lederhosen became popular in the early 19th century. A key figure in establishing the lederhosen as an acceptable piece of clothing was Erzherzog Johann, Duke of Styria. He liked to wear Tracht, consisting of lederhosen and more or less authentic costumes of linen and loden cloth, when hunting or hiking. As a hunting and outdoors-style, other nobility mostly in Austria and Bavaria picked it up in the decades that followed. In Schloss Schönbrunn, for example, the imperial lederhosen of Prince Rudolf is still on display. The styles of traditional ones were picked up and altered. They were formalised in the late 19th century and not transformed since then. High-quality lederhosen with appropriate jackets and accessories are considered formal dress in Western Austria, similar to the kilt in Scotland. Tyrol, Salzburg and the Salzkammergut are the main centres for lederhosen aficionados and people there still wear them, even if there are not tourists around. They come in different colours and styles; the most common one is the "Salzburger Schwarz" or "Salzburg black" for dyed ones. In terms of materials, there are various kinds of leather used for lederhosen. Cow leather can come in different degrees of quality, the highest would be Nappa. Chamois and deer leather are generally softer and more expensive; they are usually not dyed and come in a khaki-grey shade. By the way: The older and more worn your lederhosen looks, the better. In that respect they are a bit like Barbour jacket - if a lederhosen looks perfectly new (meaning, with no shiny parts), you stink of new money. Speaking of money: A really good Salzkammergut lederhosen is always custom made and can cost several hundred Euros. It pays back, as it is meant to last for a lifetime and can be repaired. However, you will have to wait for weeks or even months until it will finally be delivered.